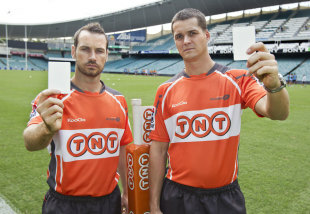 Super Rugby is set to break new ground this season with the addition of a white card to a referee's armoury. SANZAR announced a trial of a rugby league-style "on-report" system last month that will allow the referee to refer incidents of suspected foul play to the citing commissioner when the identity of the perpetrator is unclear. As part of the experiment, it has been confirmed that referees will carry a white card in addition to the yellow card used for sin-binning offences and the red card for dismissals - beginning with the Super Rugby season opener between the Blues and Crusaders in Auckland on Friday. "The white card will be helpful in instances where a referee thinks an act of foul play has occurred but is not sure if a red card is warranted, or is unsure of the identity of a player," explained SANZAR game manager Lyndon Bray. "It will also help get to the bottom of instances where a player makes a complaint to a referee who did not see an incident." Australian referee Andrew Lees welcomed the innovation, commenting: "I think it will assist us in removing incidents from the game that the IRB and SANZAR are trying to remove and clean up the game in terms of foul play," he said. "That [new system] makes it a bit clearer for the public, who in the past may not have known things are going to the citing commissioner. We're just making the process a bit more transparent to the public eye." Other changes to the disciplinary system will see any cited players handed shorter bans if they plead guilty to their charges before hearings that will also be conducted via video conferences in order to speed up decisions.